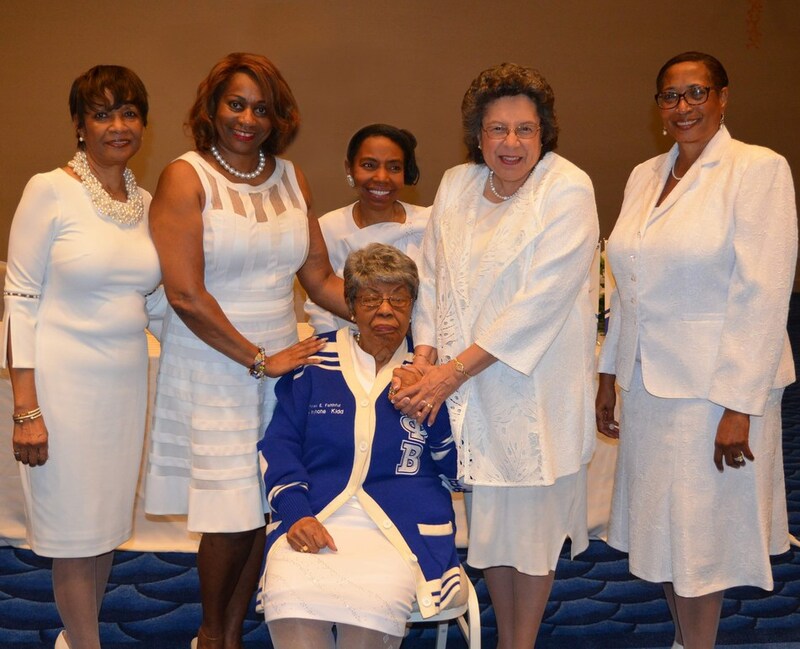 Zeta Phi Beta Sorority, Incorporated inducts Wynona Kidd, the daughter of Founder Viola Tyler Goings and niece of Founder Myrtle Tyler Faithful as an honorary member. She is the oldest living descendant of Zeta’s five founding members. Standing from left to right: Deborah Hill, niece; Valerie Hollingsworth-Baker, 25th International President; Kyra Hardiman, daughter; Dr. Mary Breaux Wright, 24th International President, and Dr. Jylla Tearte, 20th International President; seated: Wynona Kidd. Zeta Phi Beta Sorority, Incorporated, a leading women’s service organization, concluded its international executive board meeting at the Grand Hyatt Baha Mar, Nassau, Bahamas on Jan. 12, 2019 with the induction of Wynona Kidd as an honorary member. Kidd is the daughter of Viola Tyler Goings and niece of Myrtle Tyler Faithful, two of the sorority’s founding members. At 95 years young, Kidd is the oldest living descendant of the organization’s five founding members. “As we celebrate 99 years of service today, and prepare for our Centennial in 2020, we are delighted to welcome Mrs. Kidd into our sisterhood,” said Valerie Hollingsworth-Baker, Zeta International President. Zeta members voted to induct her as an honorary member during its 2018 Grand Boulé in New Orleans, La., along with Louisiana State Senator Regina Ashford Barrow. During the sorority’s visit to Nassau, Zeta leadership made a courtesy call to Bahamian Prime Minister Hubert A. Minnis, and Bahamian Deputy Prime Minister and Minister of Finance Peter Turnquest. While on the island, International President Hollingsworth-Baker also presented a $25,000 donation to the Ranfurly Homes for Children on behalf of the organization. Zeta Phi Beta Sorority, Inc. was founded in 1920 on the campus of Howard University. The international organization’s 125,000+ initiated members, operating in more than 850 chapters, have given millions of voluntary hours to educate the public, provide scholarships, support charities, and promote legislation for social and civic change. For more information about Zeta Phi Beta Sorority, Inc., please visit www.zphib1920.org.